The club’s board held a meeting today to discuss radical new plans. NEWPORT GWENT DRAGONS have this evening confirmed plans to establish themselves as a fully independent club with a view to attracting private investment. 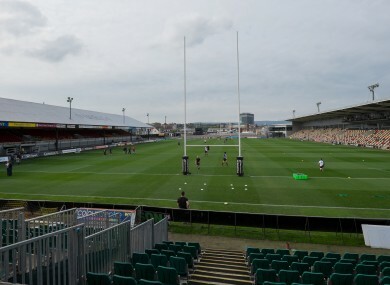 The Guinness Pro12 side are jointly owned by Newport RFC and the Welsh Rugby Union but under new proposals, approved at a board meeting today, shares would be transferred to new owners. In a statement released via the club’s website, Chief Executive Stuart Davies says work behind the scenes has been taking place over the last 12 months and it is hoped this ‘landmark decision’ would lead to improved results and a brighter future for rugby in the region. “This is a hugely important decision that will hopefully enable a new chapter to be written in the Dragons’ story,” Davies said. Last November, the club’s founders, Gwent Rugby Ltd, went into administration and a new company, Dragons Rugby Ltd, was established in its place. But the situation on and off the pitch hasn’t improved with Kingsley Jones’ side sitting 10th in the Pro12 standings with just four wins. That said, the Welsh outfit are preparing for a Challenge Cup quarter-final tie against Gloucester this weekend. The European campaign has been the one bright spark in an otherwise dispiriting season at Rodney Parade and this evening’s announcement comes as little surprise. In any event however, it is both timely and appropriate to acknowledge the bold nature of the decision taken by the Board, and the huge contribution that the likes of Tony Brown, Martyn Hazell and Will Godfrey have made to professional rugby at Rodney Parade throughout some difficult times. “Perhaps only those ‘on the inside’ can truly appreciate what they have done, but take it from me their legacy is a significant one. Email “Newport Gwent Dragons announce 'bold' decision to become independent club”. Feedback on “Newport Gwent Dragons announce 'bold' decision to become independent club”.